I must admit this photo doesn’t make the station and travelling by train look very welcoming..We’re very lucky where we live here in the UK just half an hour from London, very good train service & I have no problems travelling by myself, but I wouldn’t travel late evening on my own!! Your Cape Town photos and the comments about living there are enjoyable. It is much an art exhibit. You seem to have a good view of life there and I appreciate that you share it with me. 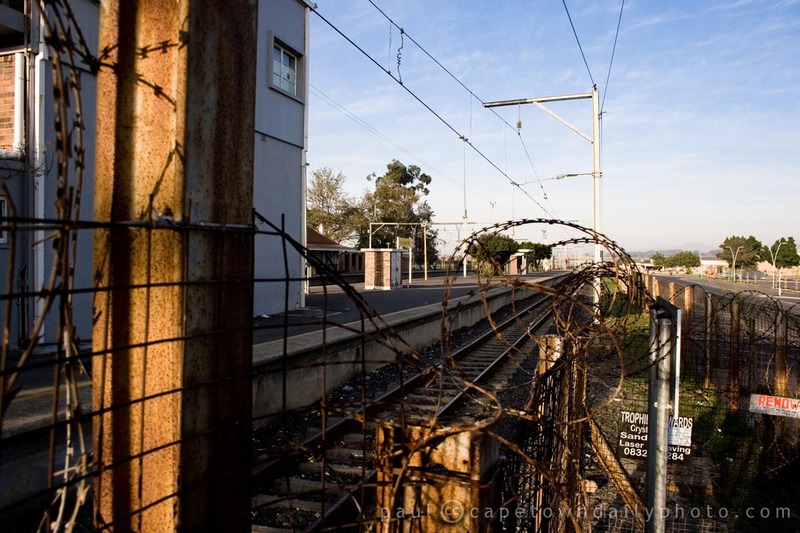 You’re right there Bev, the barbed wire and rusted fences make it look like a dangerous place… which it’s not really. Sure, I wouldn’t want to hang around there at night, but I’ve never felt unsafe during the day. Ali, yeah, I’d say if you’re a visitor to Cape Town you’re less likely to know what the danger signs are so it would be best to be safe and stick to busier times. Good call.